I was surrounded by murmuring crowds, lights, bustle — energy to thrive on for days. In a sea of creativity I happened to wander into a quiet side studio. 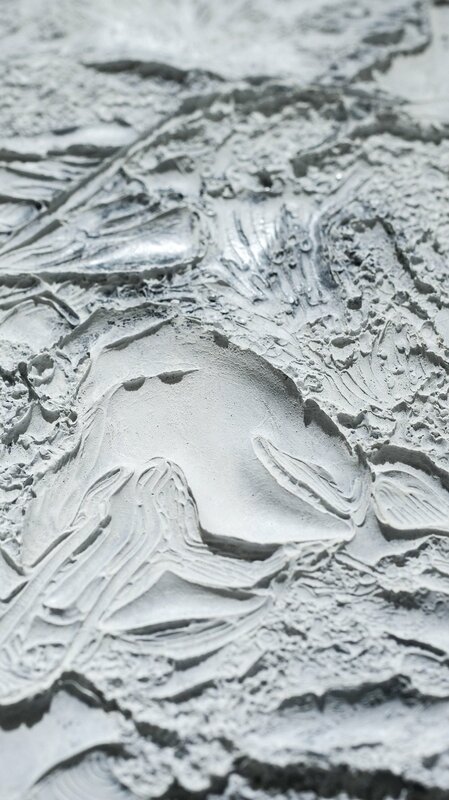 It was covered in simple and evocative, textured work of cold wax. I scanned the wall, taking in each piece. They were each so striking. Moving. The way that I felt with this piece confounded me. What was it that moved me? When she said those words it was like an arrow straight through to my heart. She spoke of putting all of your self into your art. Your work calls to the souls of others when they intuitively resonate with the deepest parts of yourself in each piece. In the past I have created art to be Instagram-able — commercially viable — and not from the deepest place from within me. When I was growing up all I ever wanted to be was an artist. Before the current buzzword conversation around finding your passion people just asked, “What do you want to be when you grow up?” Any time someone would ask me, it was always the same answer; artist. I have always known… I will be an artist. I will create. I am an artist. That worked when I was young. Everyone would smile, pat me on the head, and be glad for me in the way you would a child who just said they wanted to be an astronaut or president. But as I got older the responses changed to “That’s nice, dear, but what about a job?” This confused me because I never saw a difference. Being a creator is my life’s purpose. I just assumed that my calling and my career would be one and the same. I sensed that answer was no longer satisfactory. In response to the change I began to add the word “commercial” and that seemed to satiate the inquisitors. And so, it was decided. I would be a commercial artist (whatever that is). What I didn’t know was that the shift from creator to “commercial artist” I had placed a great deal of pressure on my internal creator to make something commercially viable. In order to make a living I thought I had to focus on making things that people would like. Popular things. Appealing things. Things that would sell. I had focused on the external and had forgotten my internal truth. What a burden to place on the muse. My muse would live under this pressure for about 15 years before throwing up her divine hands in disgust and go on vacation, leaving me creatively barren. Lost. Hollow. Burnt out. I had applied such pressure to my creativity to be what others wanted of me that I lost the connection to who I am. I placed my value and worth in the hands of others. My work was a part of me and so what they would pay for my creativity was what I was worth. I had lost the inner knowing that my worth is not the price tag that I place on my products. So it was startling to hear the words of an artist who had remained true. The emotion I felt rising was the proof. Art that moves you is art that is true. In a moment she cut through the years of running from myself. She stopped me dead in my tracks. Art isn’t for everyone else. Your art is for yourself. Creating work that resonates within you means it resonates with a very real and human emotion within others who are open to receive it. I didn’t even know how much I had been craving, desiring, yearning for such truth until it was revealed to me. It brought me to tears to think that there is indeed a place that I can go to be honest and tell my truth. A place to hold everything — all of my hopes, dreams, fears, imaginings, knowledge, and questions. I was just handed a ticket to that place. It is in my art. That is where I can be; true, real, honest. In my art I can be myself. It’s not about finding your passion, gaining approval or sales — creating art is about sharing your deepest truth.